They should have waited for Beyonce. Not a Bradley fan before this, but the character he plays is incredible in the movie. So warm and kind. 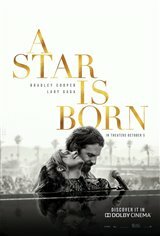 The movie gets a bit tedious when it focuses on Gaga's character, but when it's about him, it was amazing! The songs were great, too. Looking forward to getting the album. Stick with the Garland and Mason version; the "music" in this was pants. This is a remake of a remake. All were great movies set in different times. All story lines are similar. This movies has great stars and fantastic songs. "Evergreen" & "Are you watching me now" were great songs that came from the second movie. I believe this remake will have at least one song nominated for an Oscar.